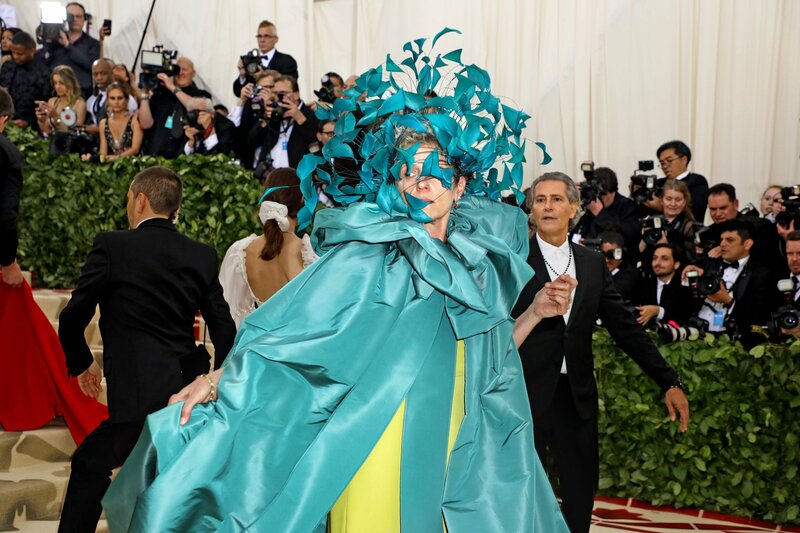 GOSH!ABOUT: The Top 20 Met Gala 2018 Red Carpet Fashion Disaster List! – GOSH!About: Fashion. Art. Music. Events. TV. Non Profits 'N' Lifestyle > Subscribe now! Whose On The List For 2018? All Photo Credit: Damon Winter/ The New York Times. May 7th, 2018 brought the A-Listers out to attend the MET GALA 2018, The Metropolitan Museum of Art’s Costume Institute benefit gala celebrating the opening of the Heavenly Bodies: Fashion and the Catholic Imagination exhibition, in New York. A fusion of fashion and heavy Catholic influences from Greece and Rome. Basically Fashion and Religion in one event. Daring! Co-hosts with Anna Wintour this year was Rihanna, and Amal Clooney. Plus, Madonna did a special performance opening tonight’s event. Yet, many of tonight’s guests missed the fashion-mark which we will focus on. Some only missed a point or 2, in which we will give them an “Honourable Mention” and some missed it by far, and there were others who just didn’t try hard enough or tried way too hard. Why didn’t they get it right? Let’s get into it! 2. Co-host Amal Clooney, missed the boat. She has always done a beautiful classic look, and this year I have no idea why she looks like a dear whose just been flashed with headlights. She appears out of place. 3. Lena Waithe in that rainbow cape. I get it for the LBGTQ community, but this is the MET GALA. OMG! I can’t! 4. Solange Knowles: Solange So Lange. Ok we get the “Symbols” , the Florida Water,and all the Ether that comes with it, but a durag to the MET GALA??? Are you trying to say BET GALA? Not tonight. Solange Knowles wearing Iris van Herpen. 5. Honourable Mention: Kim Kardashian West – dripping in gold was beautiful until they slapped on 2 crosses. What?? hmmmm… If they had just did a pretty cross cut-out in the back, Kim would not be on this list. She almost had it that’s why we are doing an Honourable Mention with her. Next time! Kim Kardashian West wearing Versace. 6. Frances McDormand– OH BOY! When I saw the birds/bugs/bows… who knows.. buzzing about her face down the red carpet, I just shook my head. Why? Can she see? Is she tipping over? 7. Mary J Blige– hmmmmmmmmm… That simple. That thigh high boots, I know its your thang, but not for this look. Something is throwing me off with is look. 8. Michael B. Jordan – NOOOOOOOO!!!! am I having deja vu? Didn’t I see him in this exact outfit already? Omg, wait. Gosh! yes in bed. If he wore the pants only and showed his buffed chest– the best. What list??? Michael B. Jordan wearing OFF-WHITE. 9. Danny Glover– Love the video ” This Is America”, but for the red carpet – NO! Try again. 10. Gigi Hadid– pretty, but didn’t try hard enough. Its not enough power to be pretty on the red carpet, please show some creativity. The MET GALA is the perfect opportunity. Being ” safe” is such a bore! 11. Jaden Smith – He just came to promote the Gold Plaque- (Hold up! He went Gold?) Show off! His outfit, perfect for the Club, but the MET GALA ?? See, if he went Platinum it would have worked! 12. Issa Rae – Oh Lawd help me. Why? Why this one? What can I say y’all? I fell out my chair on this one. Try harder next time Issa, cause you never play safe. Since when? 13. Scarlett Johansson – This look didn’t do nothing for her but added some years on. Who dressed her? She is such a beautiful woman. I truly wished some of these ” hired stylist” would actually do their job and research before dressing their clients. This shot is forever. Geeezzz! 14. Chadwick Boseman – Great movie. Great actor. But why did they patch his wardrobe up with crosses. There is no creativity. It looks slapped on randomly and said go! Really? 15. Kendall Jenner – NO! This says nothing about Heavenly Bodies/ Rome/ Greek/ Catholic Theme. She didn’t even try. To the club? Maybe. A waste of fabric. Kendall Jenner wearing OFF WHITE. 16. Sofia Coppola in a sack in blue and black. What’s this??? She’s not even happy or pleased either. Holding that anger in. Just do it for the shot girlfriend! 17. Tiffany Haddish – didn’t even try. What’s this mix up about? Where are you taking me with this look? Geez, not even some tips on the nails? no mani? Come on Tiffany. 18. Nick Jonas – Not impressed with his fit. That hair cut makes him look odd. It does not fit his facial structure at all. The whole look is too tight for his body. Which part of this is Heavenly Bodies? 19. Gabrielle Union– is getting a ” didn’t try hard enough”. Its pretty, yes, a burst of sunshine, but that’s it. No creativity. Nothing really to say…. much. 20. We end our list with an “Honourable Mention” for SJP – Sarah Jessica Parker. Since, no one wants to point to the elephant in the room. I will. What happened to Sarah? OMG. She looks …. beyond her age. Who is stressing this woman OUT? She gets an A for the outfit! We LOVE IT! What we are upset with is her makeup!!!!!!!!!!! NO! Stop. Whoever did this woman’s makeup, need to pack their bags and go back to makeup school. Sarah has very pretty eyes, but this blue eye- job ruined it. I was so shock! At this point, Sarah Jessica Parker, needs a healing – vacation to the Himalayas. Enter an ashram, go through some Vedic healing and rejuvenate. Two- weeks of necessary peace. Doctor’s order! These were our top 20 picks for our first MET GALA 2018 Red Carpet Fashion Disaster List! There is always next year (2019), to go harder and more creative with a bit more dare. I highly recommend doing some research before designing your themed look. Which outfit had you questioning yourself? Let us know in the comments below. This was lots of fun, and the event was absolutely amazing. If you enjoyed our picks tell us, and if there was an outfit you wished we added, tell us. We would love to know.